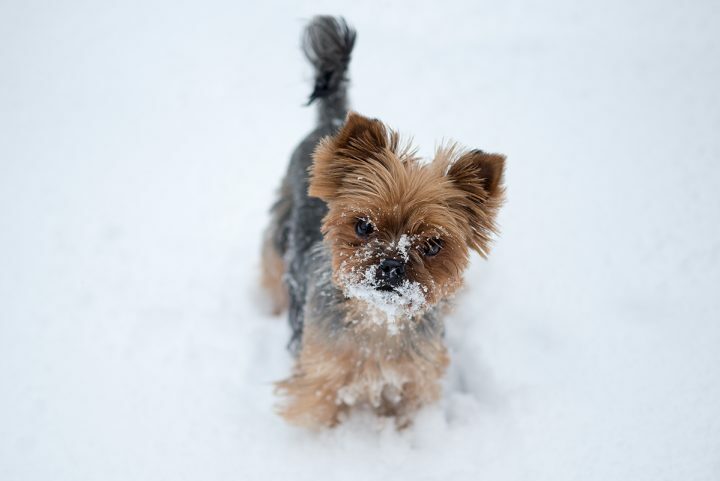 One of the more common questions received in the veterinary clinic is whether dogs should be on year-round heartworm prevention, even in the winter and colder months. Over 20 years ago I was taught in veterinary school that the average ambient temperature had to be 65 degrees or higher for 30 days in a row for mosquitoes to become infectious and transmit heartworms to dogs. In most areas of the country this transmission season was believed to be 3 to 5 months. However, in recent years with concerns of global warming and milder winters, veterinary parasitologists have found that it is possible for mosquitoes to carry heartworms even in milder winter months. Because of this and the fact that many people travel with pets back and forth to warmer areas of the country, most veterinarians and the American Veterinary Heartworm Society now recommend year-round heartworm prevention for dogs in most areas of the country. An added benefit of most monthly heartworm preventatives such as Heartgard and Iverhart Max is that most of these preventatives also treat and control many intestinal parasites, which can also be a problem any time of year. If your pet is not on heartworm preventative medication, it is strongly recommended that you have a blood test performed on your pet at the veterinarian’s office so that monthly preventative can be started to prevent this potentially serious disease. For clients interested in more holistic heartworm prevention options, herbal products such as black walnut and quassia bark can be considered. In these situations, a consultation with a holistic veterinarian is recommended (e.g. www.doctordym.com) as many alternative products have not been proven effective in clinical studies, so that often their use is empiric and based on clinical experience. my dog dozer a pitt 3 yrs old has heart worm, his skin is very dry, and falling out all the time, when he drinks his water to fast and eats to fast he throws up all this flem with his food, some times he gags or lately when i walk him he sort of gasps for air , i thought because he’s strong and he pulls me to his destination to get to where he wants to walk too, , i can’t offord meds for him, what can i do, ppl say that he’s suffering, but yet he is so playfull, he is a very good dog, can u help me ? Should to vet about heartworm treatment with drug immitide. If this not possible, then consider monthly heartguard or iverhart which can kill heartworms with continuous 1-2 year use. Also ask vet about 30 day prednisone and doxycycline drug trials which can help with infections and secondary lung inflammations. I have a 5lb. yorkie that used to get interceptor 1x month & K9 Advantix II for flea, tick & mosquito repellent 1x month. Now Interceptor is no longer made so I want to continue the K9 Advantixx II & Sentinel. My Question is can they be used together since Sentinel also is for fleas & heartworm but not for mosquitos whick are prevalent in the area that I live. I don’t want them biting my dog. If Sentinel shouldn’t be used with the K9 what about using inverhart max for heartworm and she weights 5lbs. the inverhart lowest dose is for 6 to 12lb dogs heartguard is up to 25lb. I don’t want her to have too much meds which might make her week. I have asked my vet and I get no straight answer they just keep pushing the heartguard. Please can you help me make the right choice. I dont think a problem using the Sentinel and advantix. has a good info to dog heart disease symptoms and treatment! I have given my Shepherd Gracie, Trifexsis..but she seems to have developed itchy, dry skin after her second dose. She is a long coated girl, and I brush her EVERY DAY for at least 30 mins. Her coat is silky and shiny, and she eats top quality food w/out additives, and spends a lot of time out in the fresh air. Can you recommend another product for flea and Heartworm control ? Perhaps I should use a product for each, rather than the pill. I would go with topical revolution which does both fleas and heart worms, and has only one chemical in it. My dog began stumbling and certain noises makes her startle and mini convulse. Blood word showed she was not absorbing protein. The vet put her on presiitone. She has been on it about two years, her energy is good apatite good (side effect), however she is not getting any better. Blood work every 30 days proves it. She is now getting worse, had a convulsion at the groomers, has fallen down the stairs, poops and pees I her bed. Specialists can’t give me any answers. Where should I go from here? HI Mandy. Thanks for your contributions on the doxycycline and comments on monthly heartguard and economical resources for them. HI susan. I would consider consultation with another vet specialist who may be able to review workup done to date, as well as whether other GI drugs might be appropriate to suppress inflammatory or immune response such as prescription atopica/cyclosporine and/or chlorambucil. Also consider consulting with a homeopathic or holistic vet like myself for alternative approaches to prednisone and immuno suppressive drugs. To learn more see http://www.doctordym.com for more information. Dozer needs to be put on a HW preventive. Please do this right away as he will suffer as my dad’s dog did many years ago because he was kind of stubborn but LOVED his pets so very much. I hope this helps in some way so you can have him for a long, long time. so my border collie lab mix recently started to wheeze for no appearant reason ha was about a 2 weeks ago, we thought nothing of i bu know he has he wheezing attacks more often and doesnt seem o be drinking water what should i do to help him. Hi Charlie. The wheezing could be something known as ” reverse sneeze” syndrome, which often does not need to be treated. See You tube for nice videos on this to see if that what your dog is doing. If not that, should have vet exam and evaluation to see if infection, allergy or other inflammatory issue causing wheezing. My 11 year old Chihuahua has been diagnosed with a heart murmur. She has always been subject to coughing spells when excited, but recently has developed a different type of cough, gaging, along with runny nose and sneezing. She has been treated twice with antibiotics for the cough but each time, it stopped on it’s own the same day the treatment started, so I am in doubt that the antibiotics actually helped. The third time she developed this same type of cough, I did not take her to a vet, because it left on it’s own. Two doctors are not in agreement on the use of lisinopril for her heart. I am concerned, because I do not want to start lisinopril, or any drug, if not necessary because of possible side effects. One doctor stated he lost a dog due to lisinopril. I only wish I knew if the respiratory problems are due to her heart, or if it’s some type of allergy. She also seems t have some type of sleep apnea. I am careful about what she eats. Only Science Diet and chicken. I make chicken jerky myself.